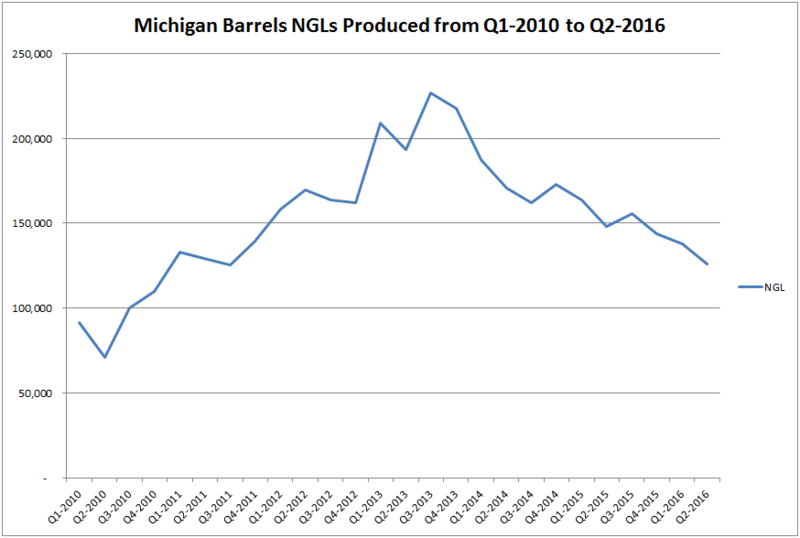 It’s that time of year again to report production numbers in Michigan for oil, natural gas, and natural gas liquids for the first six months of 2016. As stated many times here, the production data lags behind real time so we have to wait until just about this time of year to get all of the data from January to June. After compiling the data for the first six months of 2016 we see a couple of things that stand out. 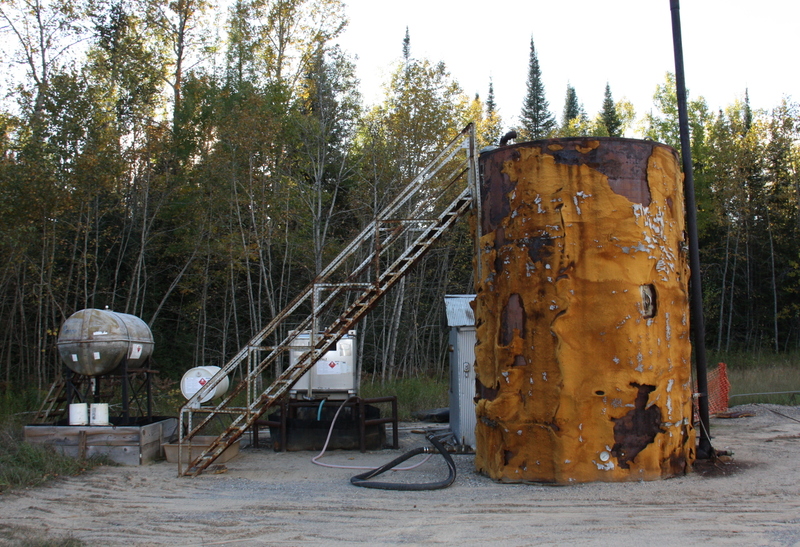 The first thing that stood out was the top producing well in Michigan was producing from the Niagaran Gray formation in Manistee County. For the many of you following along with RMP’s Michigan hydrocarbon data reporting, you know that the Trenton-Black River formation in Jackson County has been the only bright spot for oil producers over the past handful of years in Michigan. The Trenton Black River is still dominating the top 10 single well producers, but Core Energy’s State Manistee 2-14 well has taken the #1 spot. Core Energy’s well in Manistee is miles away from Jackson County and the Trenton has been knocked down a peg as the Niagaran is back on top in the Michigan Basin. RMP is predicting that Core Energy’s #CCS oil wells into Niagaran Pinnacle Reefs are the next big thing for Michigan’s Oil & Gas future. Natural Gas Power Plants coupled with #CCS technology are the clean energy bridge to our children’s brighter future. Natural Gas Plants like the Alpine Power Plant being built in Elmira Township strike the sensible balance of large scale electricity production Michigan needs with job creation and environmental stewardship. Natural gas power plants create basically no pollution or harm to Michigan’s freshwater natural resources or air quality. The Alpine natural gas plant near Gaylord Michigan will provide 700 MW of electricity on demand and produce negligible NOx, SOx, and CO2 if coupled with Molten Carbonate Fuel Cells and Core Energy’s #CCS wells. Natural gas power plants also produce zero Hg. The CO2 generated from the Alpine Power Plant can be concentrated with $FCEL technology and piped to Niagaran Pinnacle Reef wells for sequestration by companies like Core Energy LLC. This is part of Michigan’s clean energy future and a chance to showcase world class carbon negative power generation technology in the Michigan Basin. The second thing that is standing out in Michigan Oil & Gas production through the first months of 2016 is the aggregate drop off in total quantities produced. The drop-off on the oil production graph (shown below) is the most striking. 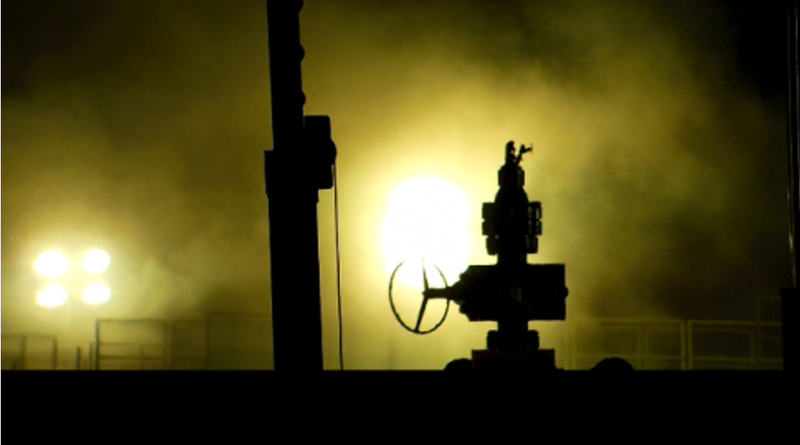 The drop-off for oil production could also be influenced by wells being shut in because of low pricing rather than solely because of the lack of new wells. Natural gas declines are also showing on the graphs below but dry gas production decreases are more gradual as the Antrim is a long term producer. Let us not forget that many Antrim units have been hooked up to vacuum systems recently so it would be no surprise to actually see Antrim production go up in the near term. But, RMP has stated before that putting Antrim wells on a vacuum is a backfire waiting to happen. Remember what RMP said in August of 2015: Oxygen finds a way. 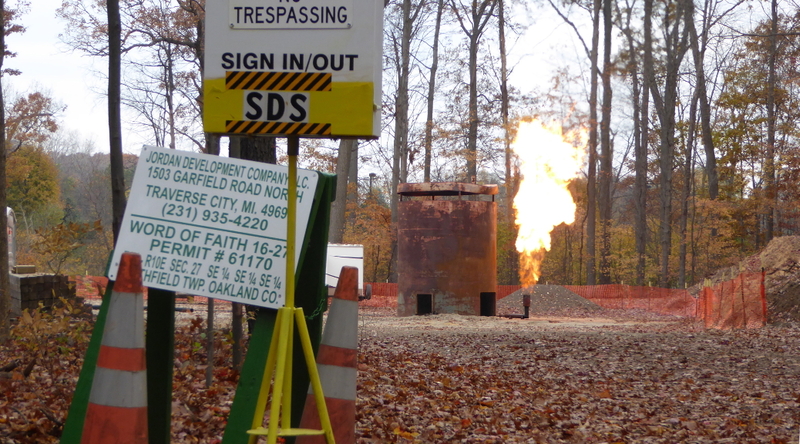 The greed that has led to trying to get more gas out of Michigan’s most prized hydrocarbon resource may actually kill the Antrim in the long run. When infrastructure gets gummed up with rust, the Antrim will die. And when I say die, I literally mean die as the anaerobic living creatures that produce CH4 in the Antrim will die if exposed to oxygen. Below begins RMP’s numerical and graphical analysis of Michigan Basin hydrocarbon production from January to June of 2016. 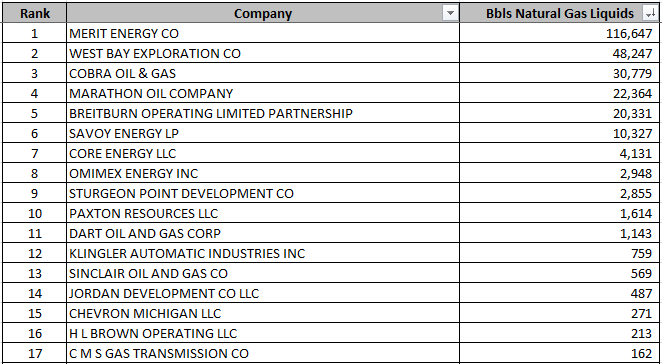 The reporting is broken down into the top 10 lists for oil, NGL, and natural gas as well as aggregate reporting for Michigan as a whole. Whenever you see the “See It On The Map” links in the top 10 lists, you can click on the link and see the well or unit of wells on RMP’s energy mapping software. #1 Beaver Creek Detroit River SZ Unit – all tracts BREITBURN OPERATING LIMITED PARTNERSHIP 44 59,006 327.8 See it on the map! #2 Norwich unit – all tracts MERIT ENERGY CO 265 57,160 317.6 See it on the map! #3 STATE MANISTEE 2-14 CORE ENERGY LLC 1 46,468 258.2 See it on the map! #4 Beaver Creek Richfield Unit – All Tracts BREITBURN OPERATING LIMITED PARTNERSHIP 191 44,203 245.6 See it on the map! #5 Jennings 1-32 HD-1 WEST BAY EXPLORATION CO 1 43,966 244.3 See it on the map! #6 Kawkawlin Central Unit – all tracts MUSKEGON DEVELOPMENT CO 58 39,148 217.5 See it on the map! #7 Curtis 1-4 HD1 WEST BAY EXPLORATION CO 1 35,929 199.6 See it on the map! #8 PEASE 20-24 AXIA ENERGY LLC 1 34,672 192.6 See it on the map! #9 Veraghen 11-21 MERIT ENERGY CO 1 33,819 187.9 See it on the map! #10 Lantis et al 1-30 WEST BAY EXPLORATION CO 1 29,350 163.1 See it on the map! #1 Milton Bradley Central JORDAN DEVELOPMENT CO LLC 28 464,418 2580.1 See it on the map! #2 HARDWOOD UNIT LINN OPERATING INC 85 458,043 2544.7 See it on the map! #3 ALBERT-LOUD UNIT MERIT ENERGY CO 78 449,062 2494.8 See it on the map! #4 DOCTOR’S CLUB ANTRIM LINN OPERATING INC 89 434,712 2415.1 See it on the map! #5 SOUTH BRILEY ANTRIM UNIT LINN OPERATING INC 74 393,007 2183.4 See it on the map! #6 CHARLTON WEST UNIT TERRA ENERGY LTD 44 355,917 1977.3 See it on the map! #7 North Bay Antrim LINN OPERATING INC 55 355,143 1973 See it on the map! #8 CHESTONIA 31 PAWN PLAY ANTRIM CHEVRON MICHIGAN LLC 42 330,882 1838.2 See it on the map! #9 STATE CHESTER VENTURE 29-2 (S10-118) ENERVEST OPERATING LLC 71 325,450 1808.1 See it on the map! #10 MAPLE FOREST UNIT LINN OPERATING INC 62 306,224 1701.2 See it on the map! #1 STATE HAYES 1-36 MERIT ENERGY CO 2 9,057 50.3 See it on the map! #2 STATE EXCELSIOR 3-25 HD1 MARATHON OIL COMPANY 1 7,563 42 See it on the map! #3 SALLING-HANSON 1-1 MERIT ENERGY CO 1 7,242 40.2 See it on the map! #4 STATE CHARLTON 2-9 MERIT ENERGY CO 1 6,661 37 See it on the map! #5 STATE FOREST 1-14 MERIT ENERGY CO 1 6,370 35.4 See it on the map! #6 STATE CHARLTON 6-4 MERIT ENERGY CO 1 6,340 35.2 See it on the map! #7 STATE VIENNA 2-31 MERIT ENERGY CO 1 6,088 33.8 See it on the map! #8 KALKASKA 21 UNIT BREITBURN OPERATING LIMITED PARTNERSHIP 18 6,069 33.7 See it on the map! #9 State South Buckeye 41-1 COBRA OIL & GAS 1 5,359 29.8 See it on the map! #10 WOOD 5-11 MERIT ENERGY CO 1 5,212 29 See it on the map! 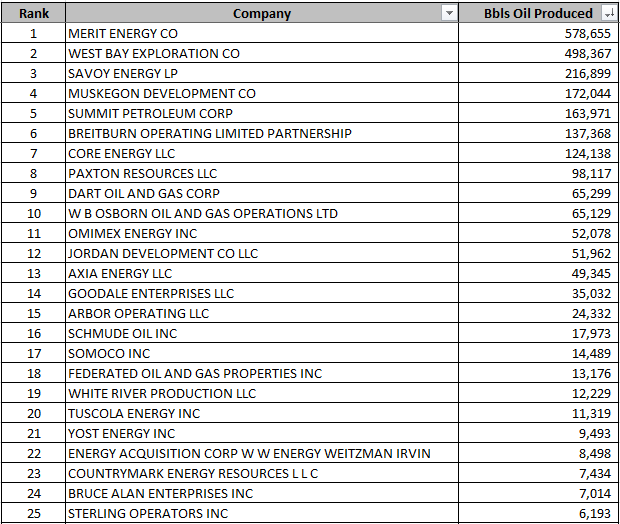 Listing of the top 25 oil producing companies in Michigan by barrels produced from January to June of 2016. Click to enlarge. 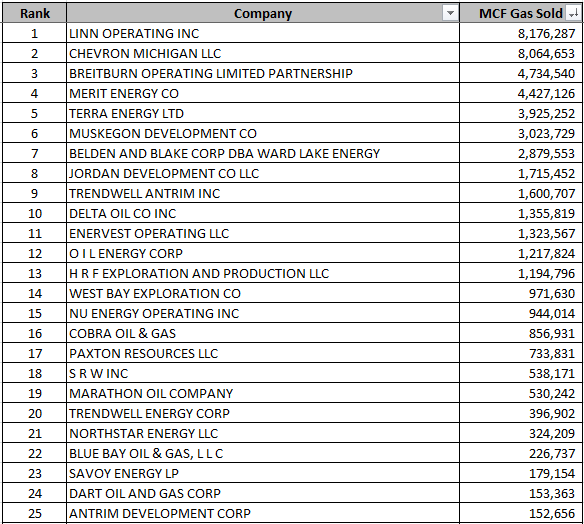 Listing of top 25 gas producing companies in Michigan from January to June 2016. Click to enlarge. Top 17 NGL producing companies in the Michigan Basin. There are only 17 NGL producers in the first six months of 2016. Click to enlarge. This is a 6.5 year rolling trend line of oil production in the Michigan Basin. 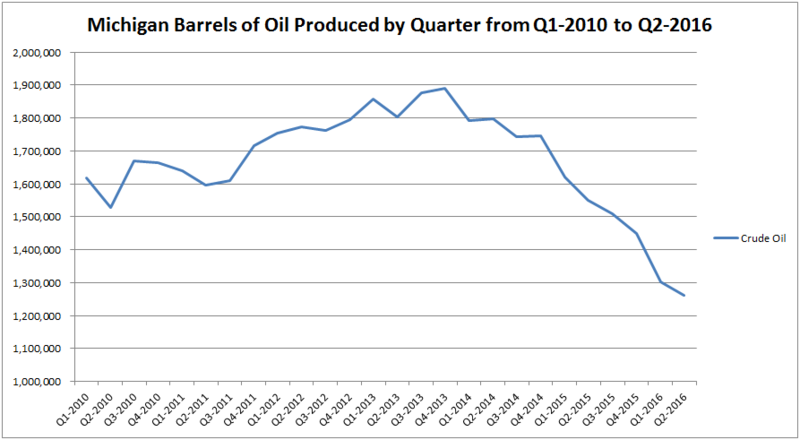 This graph truly shows the drop-off in oil production. 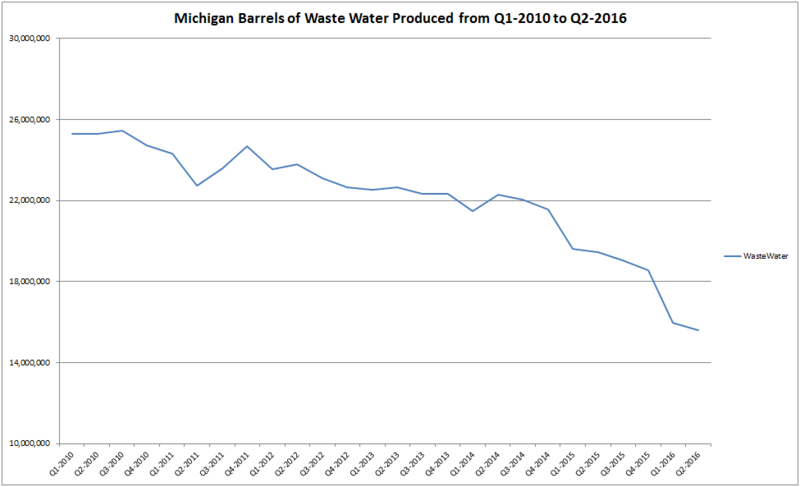 Nothing I have seen is as demonstrative of oil in Michigan than this year’s graph. Click to enlarge. Natural gas rolling trendline of the last 6.5 years by quarter. 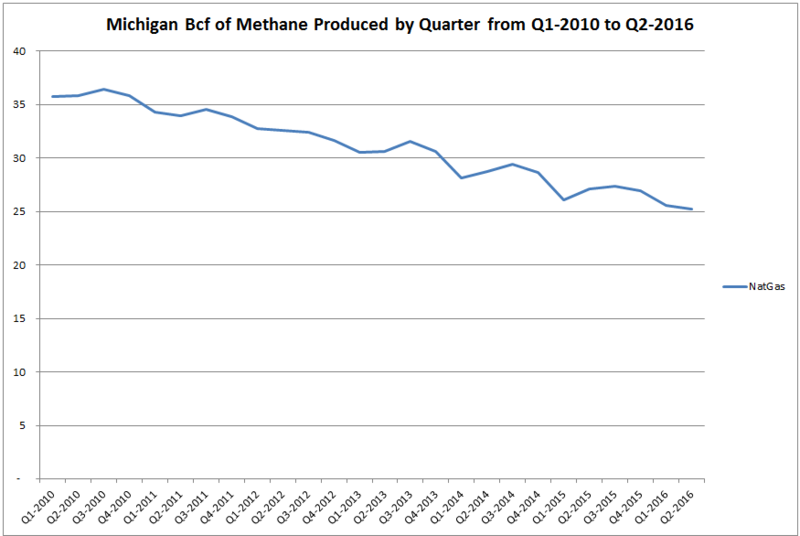 This graph is in decline but is not falling as fast as oil in the Michigan Basin. Click to enlarge. The rolling 6.5 year trend line production of NGLs in the Michigan Basin shows clearly the “pop” in HVHF production from Collingwood wells. There was a big spike when the Collingwood wells came online and they have fallen off fast. Click to enlarge. The rolling 6.5 year waste water production graph moves in concert with the decrease in oil production. Click to enlarge. 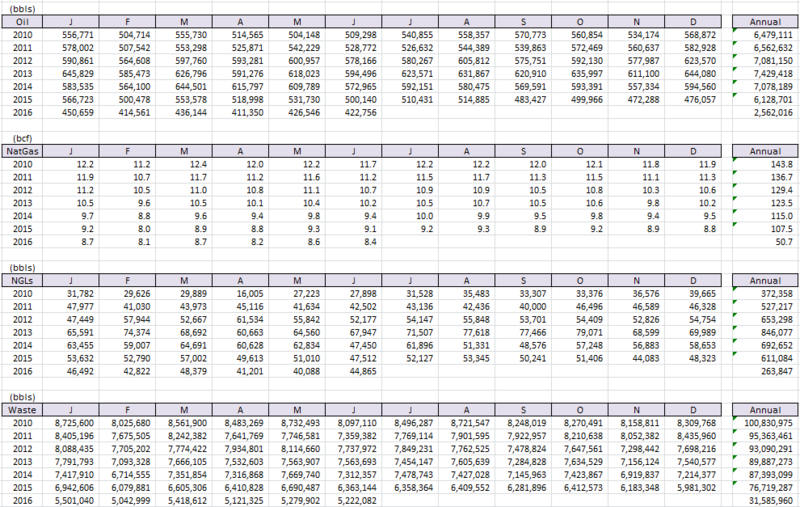 This is the Michigan hydrocarbon production data summarized by the numbers. These numbers drive the graphs shown above. Production in 2016 is for 1/2 the year multiply by 2 to annualize the totals. Click to enlarge. RMP is promoter and advocate of solar & wind energy. So is everybody else though. Saying you’re an environmentalist by saying you support solar & wind does not make you an environmentalist. It just makes you like pretty much every other person out there. The numbers RMP has been working so hard to learn over the past few years are showing that #CCS and natural gas are the bridge to a fossil fuel free future, cleaner air, cleaner water, and reduced CO2 emissions. Understanding that the transition to non fossil fuel infrastructure will take decades to complete is why most environmental groups in Michigan and around the country are moving freshwater and air protection backward by not learning about and promoting #CCS and natural gas. Let’s work together to protect Michigan’s freshwater resources and air quality. You can’t drive a car, heat your home, charge your phone, fly on a plane, or do much else without being complicit in the reason we have fossil fuels. We did not get here overnight and we are not the only country that needs to improve the way we use hydrocarbons while we build solar and wind infrastructure. Unless you’re willing to give all of your creature comforts up today, it’s time to start learning about #CCS and technologies that can responsibly phase out dirty energy for clean energy. Please help RMP educate the public about sustainable energy production by making a tax deductible donation to our 501(c)3 non-profit by clicking here. Thank you.